Federal prosecutors have decided not to retry New Jersey Sen. Bob Menendez on corruption charges, after a judge threw out some of the counts last week. Jonathan Dienst reports. Federal prosecutors have decided not to retry New Jersey Sen. Bob Menendez on corruption charges, after a judge threw out some of the counts last week. Prosecutors filed the motion with the court on Wednesday. The judge's decision last week forbid the government from seeking retrial on those counts, but left the rest of the government's case intact. "Given the impact of the Court’s Jan. 24 Order on the charges and the evidence admissible in a retrial, the United States has determined that it will not retry the defendants on the remaining charges," the Justice Department said in a statement Wednesday. In a statement following the announcement, Menendez said he was "grateful that the Department of Justice has taken the time to reevaluate its case and come to the appropriate conclusion." "From the very beginning, I never wavered in my innocence and my belief that justice would prevail," Menendez said. "I thank God for hearing my prayers and for giving me strength during this difficult time." The seven counts the judge tossed last week all dealt with alleged bribery involving political donations to the New Jersey Democrat by Florida eye doctor Salomon Melgen. Defense lawyers had argued those donations had to be tied to specific acts by Menendez to be considered bribes. That's a higher standard than the one applied to gifts Melgen gave to Menendez. Menendez's first corruption trial ended in a hung jury last fall, and the government had announced just last week that it would retry the senator and Melgen. 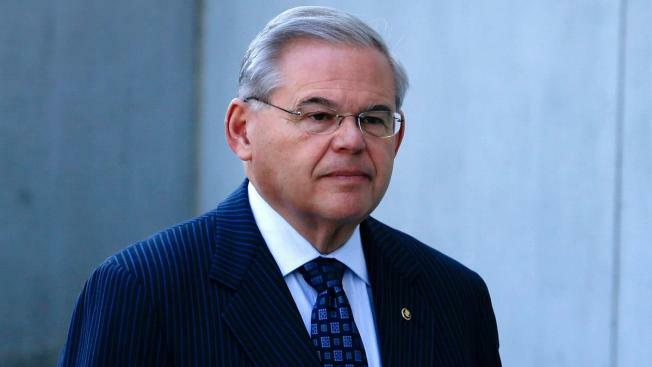 Before prosecutors' announcement Wednesday, 11 counts had remained against Menendez and Melgen, including bribery and fraud. Menendez also faced one count of making false statements for allegedly lying on Senate disclosure forms.